Happy Valentine’s Day. And all the more happy because the holiday doesn’t knock you over the side of your head here in Germany. But my skepticism towards this Hallmark Holiday doesn’t necessarily preclude partaking in Valentine’s-related things that I actually do like, such as cut flowers and flourless chocolate cake. 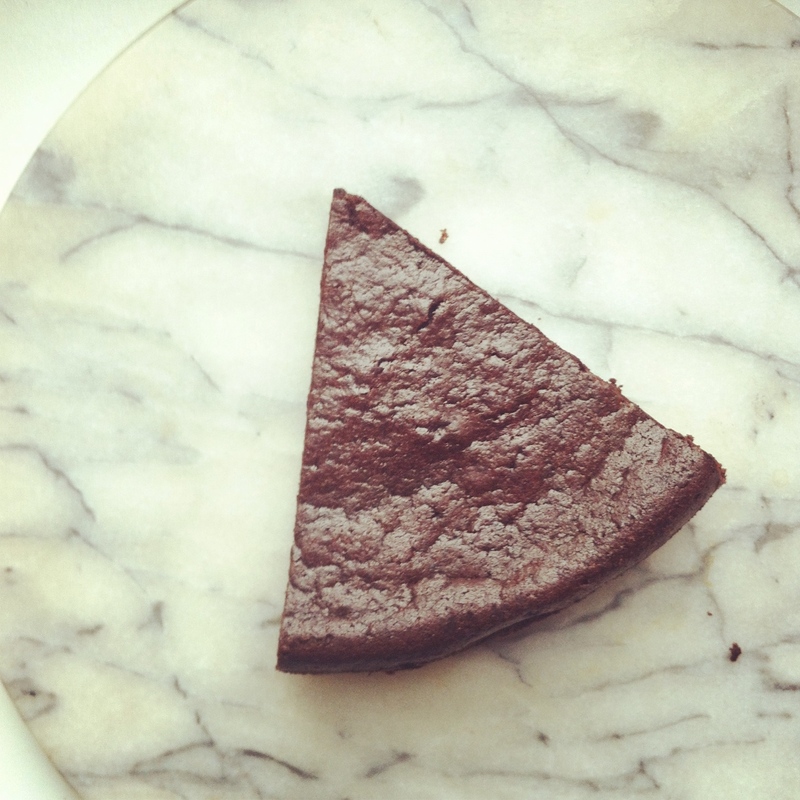 Especially flourless chocolate cake. We are usually under the presumption that such an endeavor as baking a flourless chocolate cake is a signifier of a special occasion. Yes, the rich, dense, deeply chocolatey cake or torte is one that impresses a guest or a lover, but it also need not be complicated to make. 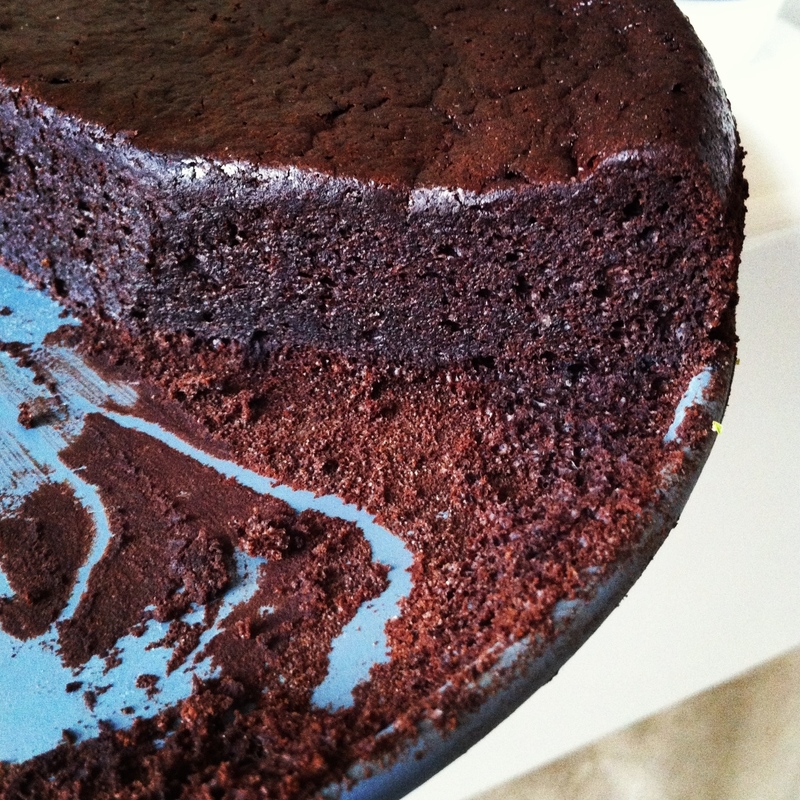 In fact, this particular flourless chocolate cake comes together so easily you don’t have to wait for the next 14th of February to make it. Why not the 18th of March? Or the 4th of August? Or tomorrow? Now, this cake is not of the species of flourless chocolate ‘bomb’ that sort of crusts on top, the kind that can be gently tapped open with a spoon to reveal a chocolate lava flow. Those are great. But ours is different. I liken it more to a steamed, creamy texture, probably due to the inclusion of the coconut milk. The texture was unexpected ­-we just threw in the coconut milk because we had some leftover in the fridge- but nevertheless welcome and comforting. It was both in an effort to save money and because we have both been under the weather for the past week that Paul and I stayed in last night. To be perfectly honest, though, as soon as the mere mention of baking a flourless chocolate cake appeared on the table at, oh, around 6 pm and my chocoholic boyfriend dashed out the door to pick up some chocolate reserves, you couldn’t have paid me to go out to the finest restaurant in town. We even found an appropriate film to watch while eating our two slices of cake each (my god, to write that- are we already that much of an old married couple?) – Spinning Plates – a documentary featuring three very different restaurants in the US and the specific challenges they face. Fascinating, concise and highly recommended! 1. Preheat the oven to 170°C (350°F) and grease a 25 cm (10”) spring-form pan. 2. Place the chopped chocolate and butter in a double boiler and melt slightly over medium heat. When it’s about half melted, add the coconut milk and continue stirring until everything is smooth, but be careful not to overheat. Remove from heat. 3. Meanwhile, separate the four eggs into two small bowls. This is where it comes in handy to have two preparing the cake together. One person can beat the egg whites, either by hand with a whisk or with an electric beater, until frothy and slightly stiff. The other can stir the sugar into the chocolate mixture, followed by beating in the egg yolks, one at a time, until completely incorporated. 4. If the bowl of your chocolate mixture has grown too small, transfer to a larger one. Slowly stir in the cacao powder until incorporated. Gently fold in the egg whites until incorporated. Pour batter into the prepared spring-form pan and set in the center rack of the oven. Check after 25 minutes by inserting a toothpick in the center. As soon as it comes out clean, remove from the oven (not overcooking is the key here!) and let cool on a rack. 5. When completely cool, remove from pan and serve, with some whipped cream if desired. The next day, the flavors and textures are even richer.